NB: This page is a sub-page of my Western Mongolia tours page. After receiving a lot of inquiries from people who want to tour Tavan Bogd and West Mongolia, but aren't sure where to go, I decided to create a recommended itinerary. These will allow you to see the most scenic parts, experience Kazakh culture and stay with nomads, see ancient petroglyphs, and visit eagle hunters. The itinerary is based on a 10-day trip to Tavan Bogd, being driven out there and either hiking or horse riding, but you could cut out some items and make it 8 days, or you could easily extend for 14 days. If you're short on time you could do a vehicle-based trip to cover more ground, but just know it's likely to be expensive. There's also some prices Bek gave for this trip, and a list of what's included. Note how your per-person costs quickly reduce when you tour tavan bogd with a larger group. If you want to get in touch with Bek and plan a trip with his company, go to my Western Mongolia tours page. I got this question from a lot of people, so I decided to put together a recommended itinerary, in consultation with Bek Travel. Bek was born and raised on Olgii, and i’ve known him for years after doing my own tour out West with him. It’s been great watching a Mongolian-owned business grow from a pretty amateurish start in c. 2006 to become a professional outfit. You can view the .pdf file with full itinerary and pricing for Tavan Bogd Tours here. Go back to my Western Mongolia tours page if you want to get in touch with Bek and tour the West with him. 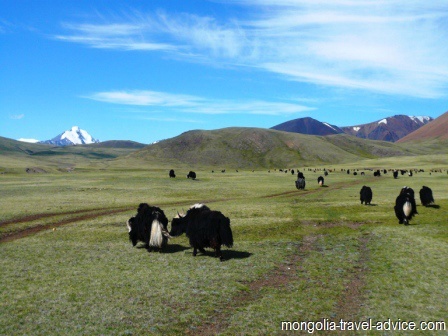 Go from my Tour Tavan Bogd itineraries page to my homepage.